If you are looking for a luxury camping site that is close to nature, the mobile homes of the Airotel Pyrenees campsite are the perfect solution. You will camp in comfortable accommodation under the trees, with mountain views, enjoying fresh air and starry nights. Get in touch with LUX-camp to find out more and to book. 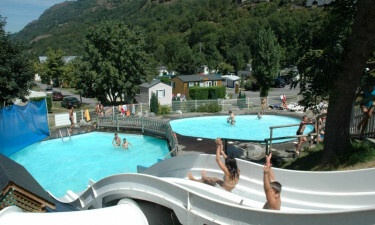 Why book your camping holiday at Airotel Pyrenees Campsite? Luxury tents and mobile homes. Enjoy mountain views that change with the seasons from our small and friendly holiday camping site. In the winter snow, this area is a popular skiing resort, but in summer the mountains are given over to walkers, hikers and cyclists. Our spacious pitches come with complimentary wi-fi. With an indoor pool and two heated outdoor pools, kids and grown-ups can enjoy swimming and splashing, whatever the weather. Enjoy the view from the top of the water slides before landing in the water below. Adults can find a relaxing space of their own in the spa, with its Turkish bath, sauna and Jacuzzi. For children, there are organised games and activities. Have a dance, a climbing lesson or socialise at fun events in the evenings. As part of your luxury camping holiday, let us help you organise your adventures outside the campsite. 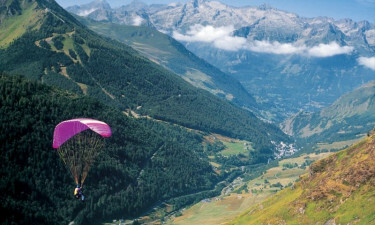 Get a bird's eye view of the scenery by taking a paragliding flight, or get up close with rafting. Let ropes assist you along the high and narrow trails of the Via ferrata climbing route, or try bungee jumping in the valley below. 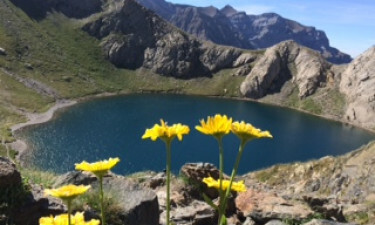 Whether you are walking or driving, there is an abundance of natural beauty to be found - from the lake of Gaube to the Col de Tourmalet, famous as a stage on the Tour de France. Visit the Pont d'Espagne to hike alongside spectacular waterfalls, or admire the views and the observatory of the Pic du Midi. When it is time for a break, stop for coffee or a meal in a picturesque mountain village. The holiday camping site is within an easy walk of the nearby village and close to pretty Luz Saint Sauveur, offering plenty of restaurant and bar options. If you would rather stay in, you can grab a snack or pizza from our handy takeaway in the evening. There is a vending machine for hot drinks, while cold drinks and ice creams are available from the shop. The camp supermarket is the place to pick up freshly baked bread for breakfast, as well as all the usual necessities and luxuries of camping life - from regional products and souvenirs to camping gas. Papers and magazines from the newsagent let you keep up to date, or relax over a crossword.